The Sundarakanda (The Beautiful Story) is a section of the Srimad Ramayana, considered to be the first great epic poem in Sanskrit. 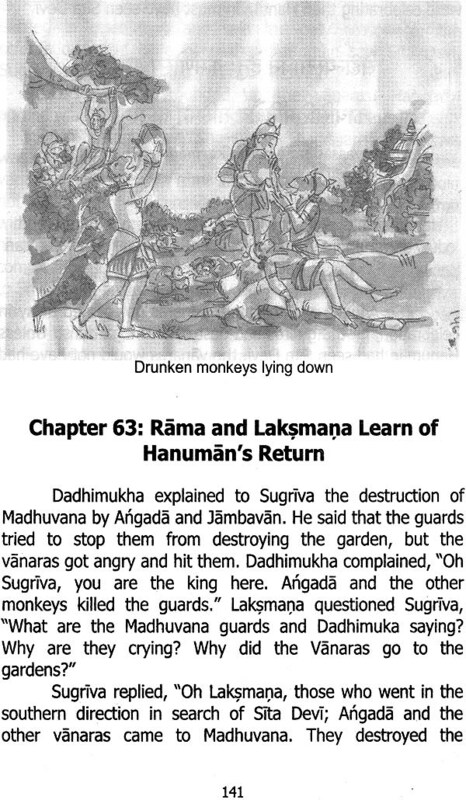 Authored by Sri Valmiki, the Sundarakanda provides an outstanding characterization of Hanuman who, with his valor, dedication and other divine qualities, overcame many obstacles to cross the ocean in his search of Sita Devi (Goddess Sita), Hanuman's mission was to locate Sita Devi and bring back information regarding her condition to Sri Rama. 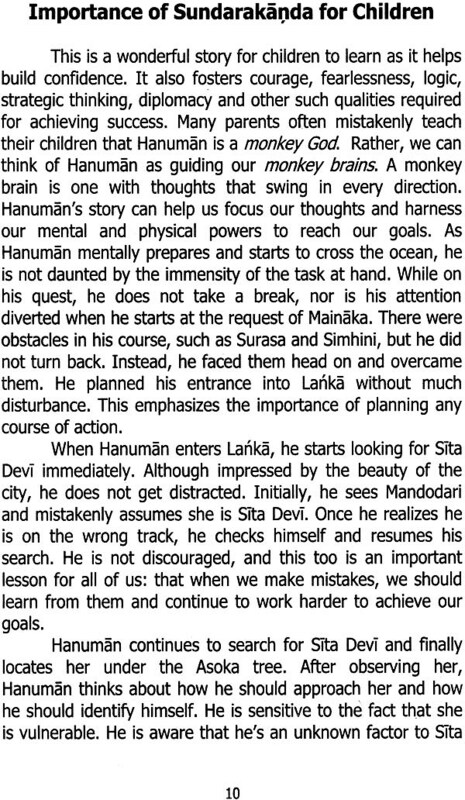 The narrative includes how Hanuman planned the task of searching for Sita Devi, crossed hurdles as they arose, solved insurmountable problems using his own ingenuity, located her in Lanka, and finally returned to report the details to Sri Rama, His character exemplifies the noble qualities of focus, persistence, dedication and problem solving. These traits are essential to achieve success in every project one undertakes. This book is a revised version of the Sundarakanda that was published on Sri Ramanavami, April 13, 2002. 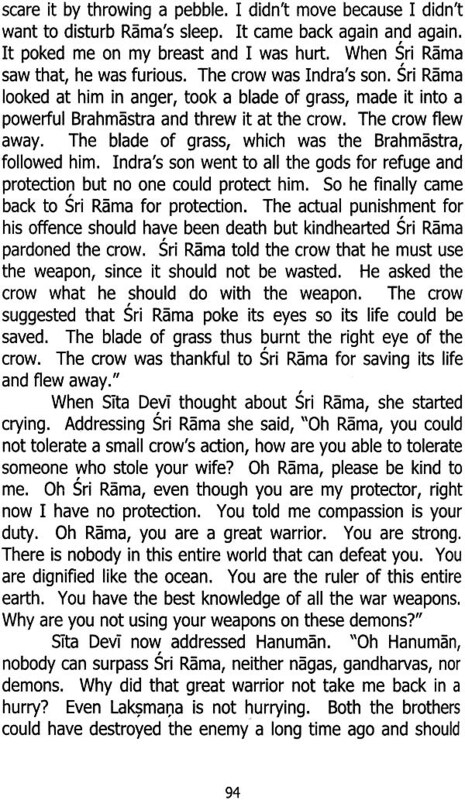 Recently, I was narrating the story of Hanuman from the earlier version to my grandson who was five years old at the time. He enjoyed the episodes of Hanuman's adventures, and asked, "Grandma, why don't you keep this book in the public library so that everyone can read it?" The current version of the book emerged from that conversation. The purpose of this book is to share the beautiful descriptions and the exemplary character of Hanuman as given in the magnificent epic of the Ramayana. I chose to write the book in English so that children not familiar with Indian Languages can enjoy and learn from the story. The purpose is to provide a role model in Hanuman, to encourage growing children to emulate his qualities. It is not a verbatim translation of the Sundarakanda, Some lengthy descriptions and repetitions were summarized to be more appropriate and comprehensible to children. May Sri Hanuman and Sri Rama bless everyone who reads this book with peace and happiness. 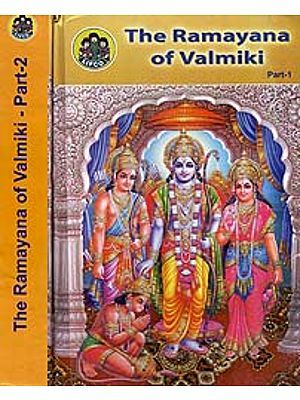 Valmiki's Ramayana, the first poem in Sanskrit beautifully describes the story of Sri Rama the encamation of Sri Mahavishnu in six Kandas. Sundara Kanda the fifth chapter in the poem is really sundaram. 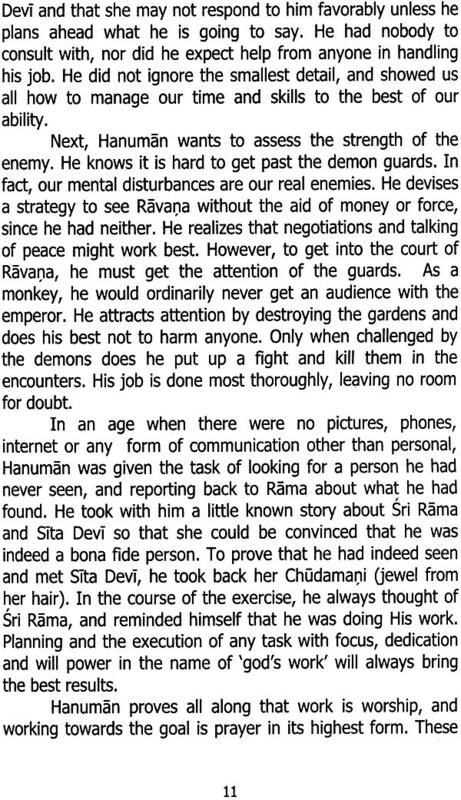 It describes the most exemplary qualities of Hanuman engaged in search of Sita Devi taken away by Ravana to Lanka. Sundarakanda is believed as most sacred book and people do parayanam of this for the fulfilment of their desires. 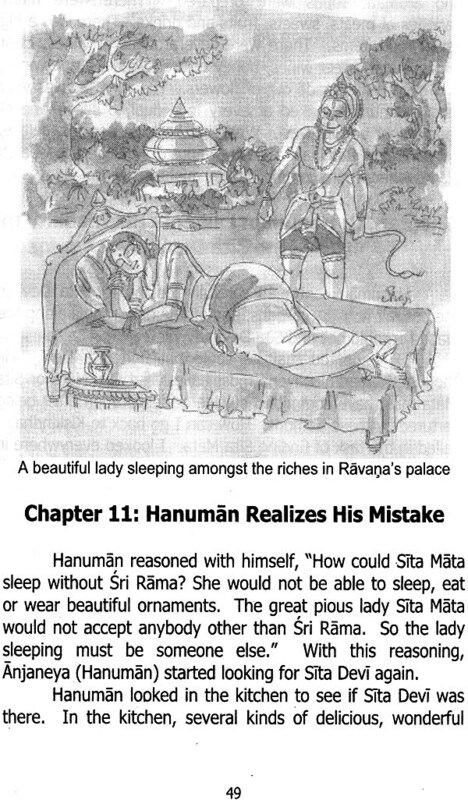 The following sloka describes the excellent effect of Hanumatsmaranam. By meditation on Hanuman one gets wisdom, strength, fame, courage, fearlessness, good health, alertness and eloquence. I am very happy that the Sundarakanda translated in to simple and lucid English is published by Tirumala Tirupati Devasthanams for the benefit of the english readers especially young boys and girls. I thank Smt. 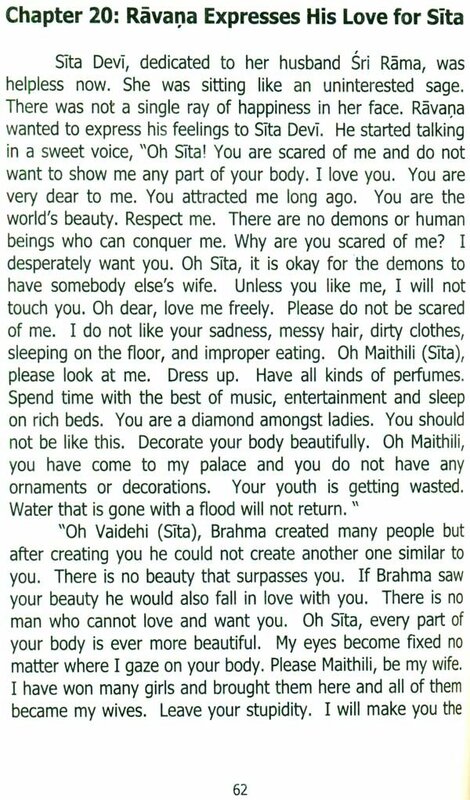 Krishna Kota (U.S.A.) for translating this book into English. 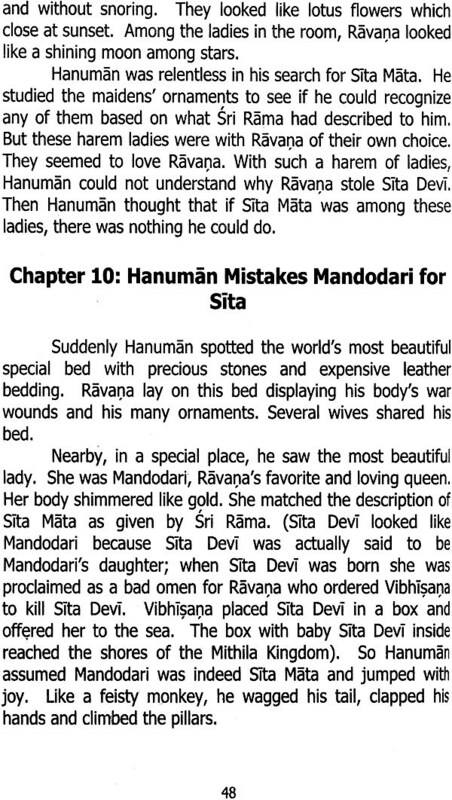 I hope the youngesters will read this book and emulate the excellent qualities of Hanuman. 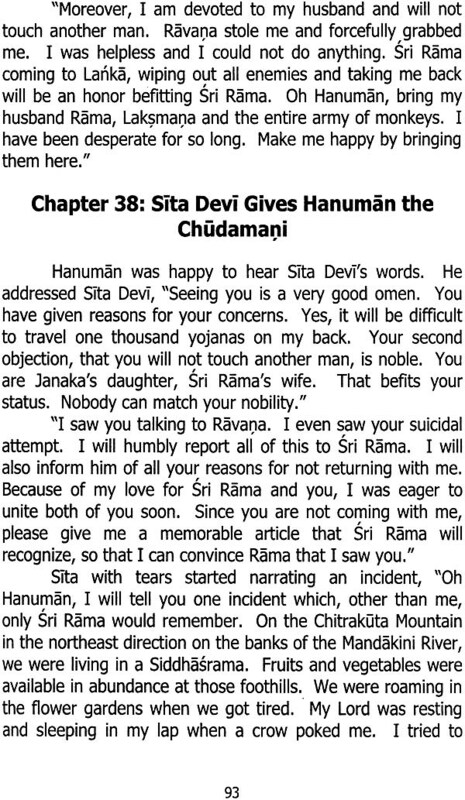 Chapter 34: Hanuman Reassures Sita Devi..
Chapter 39: Hanuman Prepares To Leave Sita Devi..